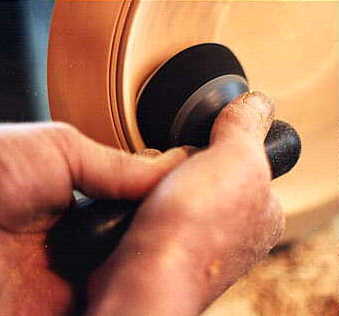 Rotary Sanding the curve on the inside of a platter. The rotary Sander makes short work of sanding the internal curves and flat sections of bowls and platters etc. leaving them with a beautifully smooth surface which is free from the normal sanding marks put in to the surface by conventional sanding. On a 300mm (1foot) diameter platter spinning at 1,000 RPM the speed of the sander at the outside edge of the timber is around 900 RPM whilst at the centre of the piece it will only be spinning at approx 300 RPM. This means that you will have to sand just a little longer in the centre to get the same results.